Is it possible for someone to be void of unhealthy habits? Where you’re automated to do what is best for your health? No more guilt-ridden mind games when you tell yourself, just one more bite and you’re done. Then, minutes later you find yourself finishing a plate of (insert your kryptonite food). Or instead of hitting snooze to delay your intention to exercise before work, you immediately get up and out the door for an early morning run. After reading The Power of Habit: Why We Do What We Do in Life and Business by Charles Duhigg, it may just be possible! “We are what we repeatedly do” – stated 2000 years ago by the great Greek philosopher and scientist Aristotle. It’s as true now as it was back then. Researchers at Duke University revealed in a 2006 study on habits that 45% of people’s everyday behavior are repetitive action. Habit formation and change is the subject deeply explored in the The Power of Habit . Our habits play a significant factor in the way we eat, move, and sleep. When we understand how habits work, we can determine which ones we want to implement in our lives and take action. “I would like to eat more vegetables!” How do you develop a habit of eating more vegetables? The first step is to understand Habit Formation. Charles Duhigg described habit as a ‘three-step loop process’ that occur in our brains. 1. Starting with the CUE, basically a trigger that signals the brain to act on a specific behavior automatically. 2. This is then followed by the ROUTINE, the behavior itself which could either be “physical, mental or emotional”. 3. Last the REWARD, the payoff for the behavior. This is how the brain remembers the pattern and make it automatic. A simple example of a habit is washing your hands before you eat. Cue – After you order at a restaurant or after you unpack your lunch. Routine – Wash your hands. Reward– Lower risk for illness. Back to the question of developing a habit of eating more vegetables? The process will be an experimentation of identifying the right cues and rewards. A reward has to be significantly valuable for the brain to remember the pattern. If the reward evokes a feeling or emotion, it tends to be more powerful than a physical reward. A visual cue! I place a package of pre-washed, ready to eat mixed greens in the fridge where it’s easy to see. (Convenience and ease plays a factor). Emotional reward. My body receives the nutrients it needs to function properly. If you want to get rid of a bad habit, raise your hand! The trouble is we can’t really make bad habits disappear. By using The Golden Rule of Habit Change, we can work towards replacing a bad habit with a better habit. Habits, good or bad, are ingrained in the brain. They are difficult to change unless ‘new neurological routines’ overtakes the old behavior. Once we understand the loop, we can find a way to take control and create a new pattern. With habit change, The Golden Rule uses the Same Cues and Same Rewards, but the Routine is changed. What’s a bad habit would I like to change? Eating nuts out of a container! It’s my favorite snack and tend to overeat them. The easiest way for me to change the routine is to put a serving of nuts in a bowl. I know it sounds so simple but I still find it to be a work in progress. Can you identify a powerful habit you have that tend to set a domino effect towards better habits? This powerful habit is called a Keystone Habit. Once developed, it strongly influences other habits you have in your life. Exercise is considered a keystone habit as studies have proven its impact on daily routines. People who are habitual exercisers tend to eat better and get enough sleep, making them more productive at work. They also show signs of less stress. Another example is keeping a food log to lose weight. A study in 2009 directed a group of obese people to keep a journal. After six months, those who kept a daily food log lost twice as much weight. The single habitual act of logging food in a journal caused the participants to recognize patterns in their behavior that led to habits of healthy eating. Journal writing was their keystone habit. What fuels the cascade of changes from a keystone habit? SMALL WINS! Small Wins fuel transformative changes by leveraging tiny advantages into patterns convince people that bigger achievements are within reach. Bob Bowman, coach of Michael Phelps used the keystone habits of visualization and relaxation, forming the right mind-set for Phelps to remain calm and focused prior to each race. Bowman honed in on the small wins and as he mentioned to the author, Duhigg “…it was best to concentrate on these tiny moments of success and build them into mental triggers. We worked them into a routine. There’s a series of things we do before every race that are designed to give Michael a sense of building victory.” The mental habits Phelps’ coach instilled in him contributed to his success as an Olympic champion. I agree, SMALL changes can truly create a BIG impact. Instead of tackling a major lifestyle change all at once, focus on the small victories. Have patience in the process. There’s an endless number of health and fitness communities whether it’s for weight loss, dietary changes, or just staying active, online and offline. When you start to feel discouraged, you can get support from members of the community you’re in. Also, observing someone else’s success could cause you to believe that you can also achieve the same success. Sidebar – Interested in being a part of a community for women whose goals are to establish sustainable healthy habits? Check out Evoke Healthy Habits Facebook group. Change is hard. To form new habits through experimentation of cues and rewards as well as to find alternative ways of behavior to satisfy the same cues and rewards in place of a bad habit requires work and determination. The process could get difficult and take time. 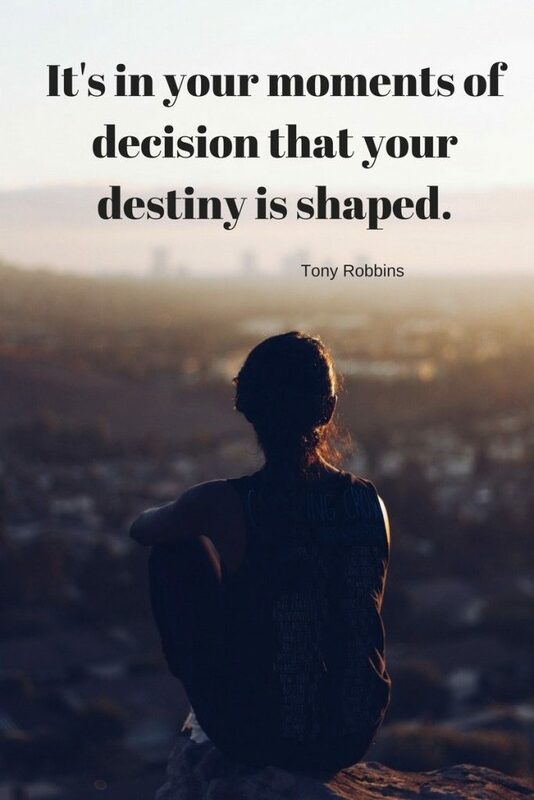 You are the only one who has control over the decisions you make in life. It’s up to YOU to DECIDE to accept the challenge. What’s one habit would you like to change or have? If you’re ready to build a lifestyle of sustainable habits, please consider joining our community for women whose goals are to achieve a life full of healthy habits. We do weekly challenges, share easy and simple recipes in addition to providing support and encouragement to each other. Subscribe for a free guide! Previous postHow to Survive a Fitness Challenge! Thanks Jamie! Hope it helps. great tips! i actually need to create a habit to eat more veggies ha! Creating new habits can be SO hard, like you mentioned. Once you make it happen, though…totally worth it. It’s a work in progress for me to establish new and better habits. Very worthwhile in the long run. Very interesting post and full of great tips! All habits are so hard to break even small ones, thanks so much for sharing!! I agree – once we’re in the swing of doing things, it takes full awareness to break away from them. Thanks Jasmine, I appreciate it! Definitely plenty of take-aways from this book.